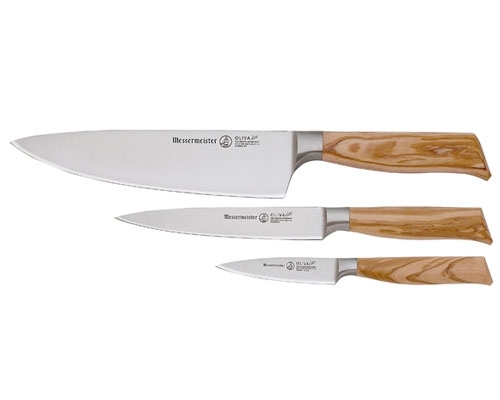 The Oliva Elite Series knives have an ergonomic unfinished natural olive wood handle. 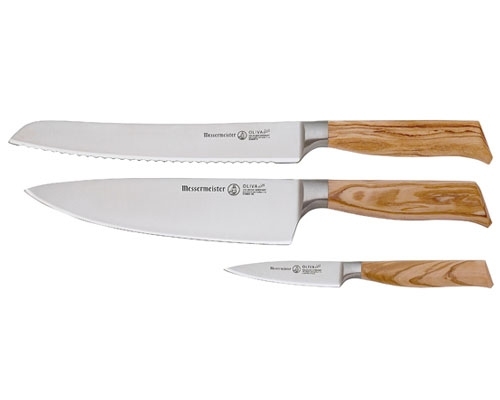 Oliva Elite knives are similar to the Meridian Elite; the blade, bolster and tang are one piece of hot-drop forged German steel. Messermeister, staying true to tradition, make each Oliva Elite knife one at a time. The Messermeister Oliva Elite 6 in. Utility Knife features reversed wavy scallops that are rounded just enough to gain traction on slippery smooth surfaces. The edge is also gentle enough to slice through coarsely textured food without shredding it. 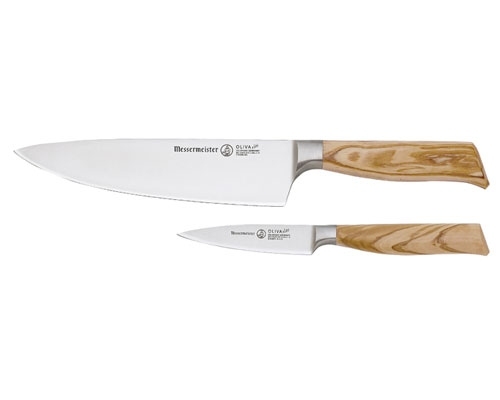 Hot drop forged high carbon steel blade with a beautiful Olive Wood handle that is perfectly weighted and balanced. This boning knife is stiff and ideal to use on poultry and frozen foods. 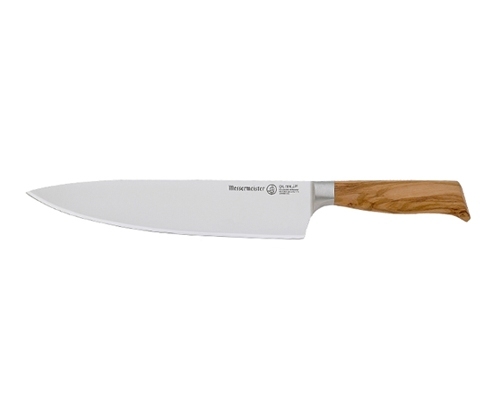 Oliva Elite is a one piece hot dropped German forged steel with a lovely Olive wood handle. The paring knife is amazing to use for cutting small fruits and vegetables. Can be used to core, slice and skin. 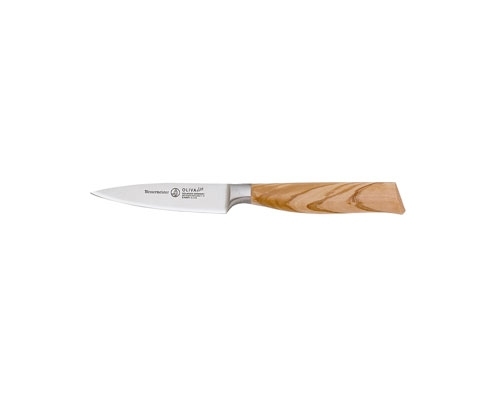 The Messermeister Oliva 5 1/2 in. 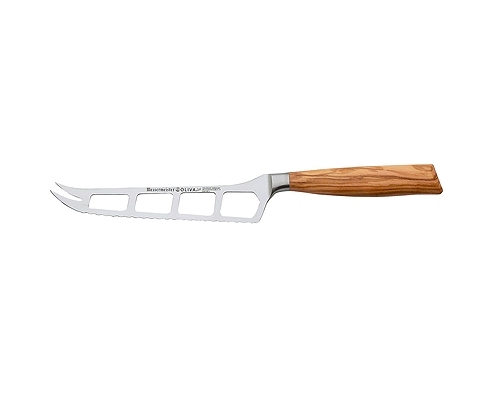 Cheese Knife is great for slicing through soft cheese, as well as slicing through tomatoes. 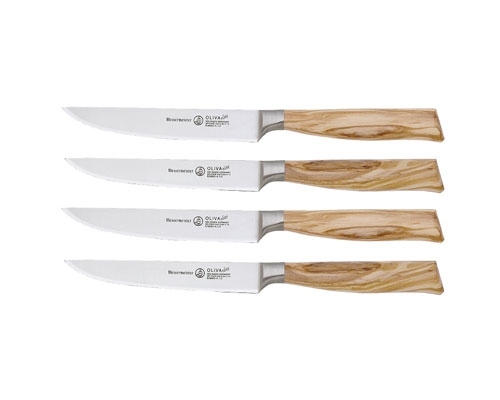 Features an ergonomic unfinished natural olive wood handle. Messermeister Oliva Elite 6 in. Utility Knife for cutting smaller items. Olive wood handle. This is a one piece hot drop forged German steel blade with a beautiful Olive Wood handle. 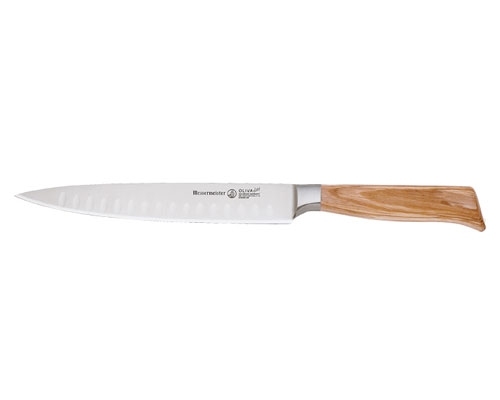 The santoku with scalloped blade ensures the food doesn't stick to the blade. 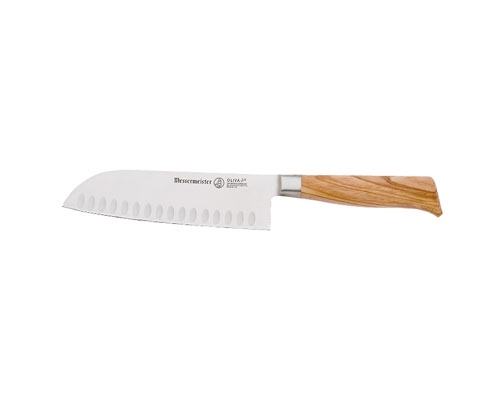 Good for chopping, slicing and cutting fruits and vegetables. This is a one piece hot drop forged German steel blade with a beautiful Olive Wood handle. 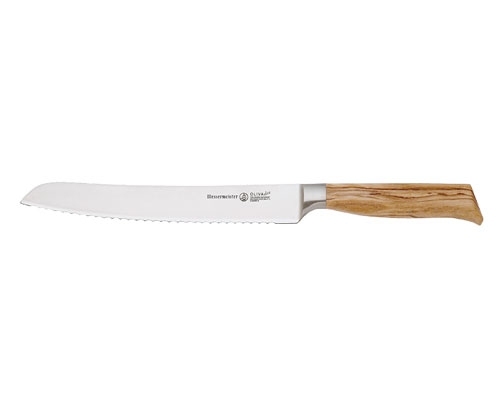 This carving knife has a granton edge, making it easier to cut through the meat without sticking to the blade. Great for holidays and special occasions. 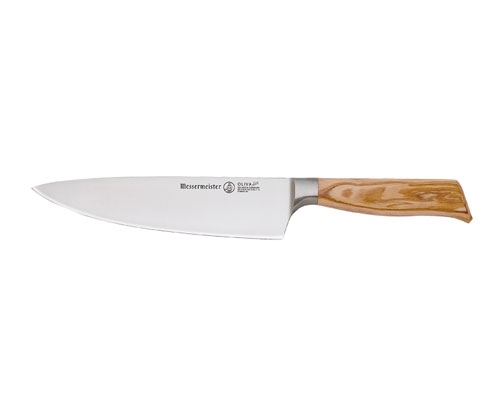 This is a one piece hot drop forged German steel with a beautiful Olive Wood handle. This carving fork is straight tine and is ideal for holding meat while cutting, also for serving and flipping meat on the grill. This is a one piece hot drop forged German steel blade with a beautiful Olive Wood handle. This honing rod is fine grit and great to use on all the Elite series and the Japanese series from Messermeister. 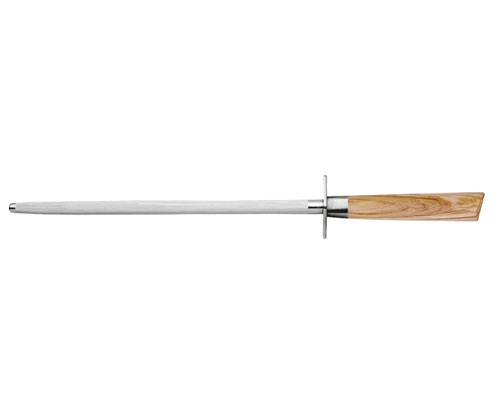 Oliva Elite is a one piece hot dropped German forged steel with a lovely Olive wood handle. 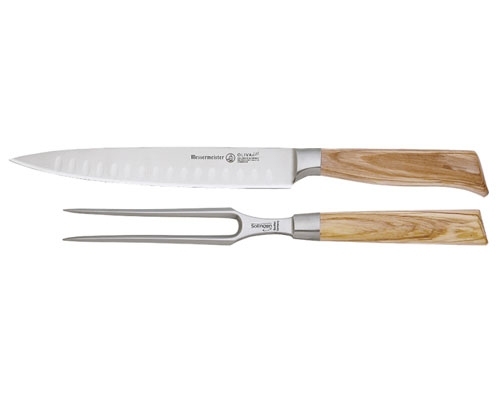 This carving set comes with a hollow ground carving fork that will not stick to the food while cutting, and a straight tine fork. Ideal for special occasions and holidays. 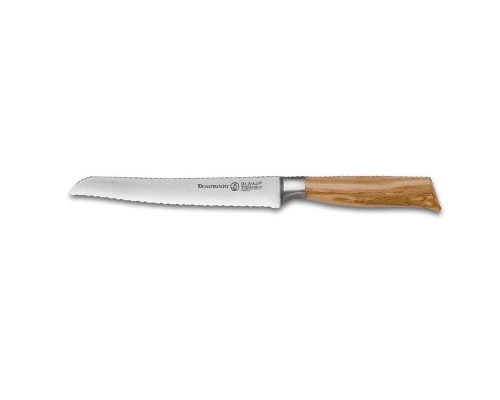 Oliva Elite is a one piece hot dropped German forged steel with a lovely Olive wood handle. This is an awesome starter set for all your needs! 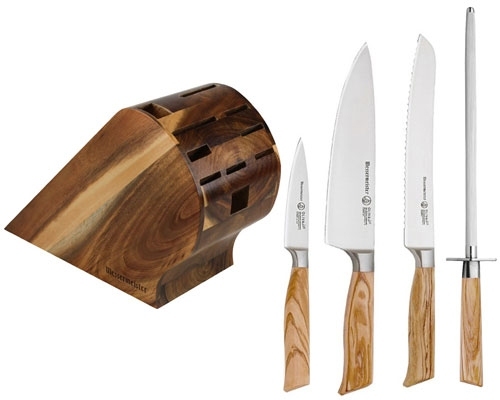 Great starter set for any kitchen! 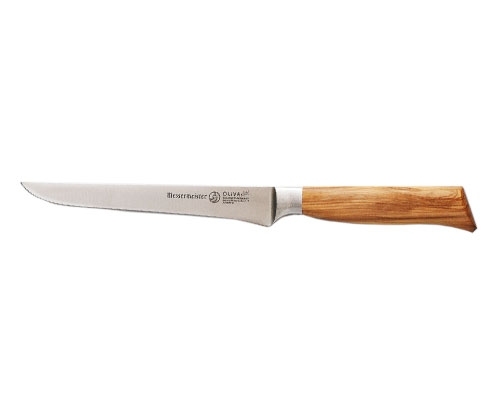 Oliva Elite is a one piece hot dropped German forged steel with a lovely Olive wood handle. 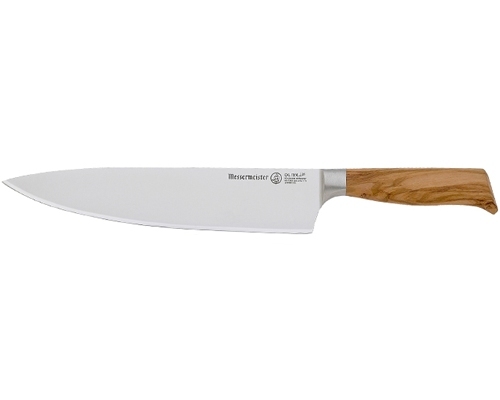 This steak knife has a fine edged blade with small serrations to perfectly cut steak with a pulling motion instead of pushing. The Messermeister Oliva Elite Multi-Edge 6 Pc. 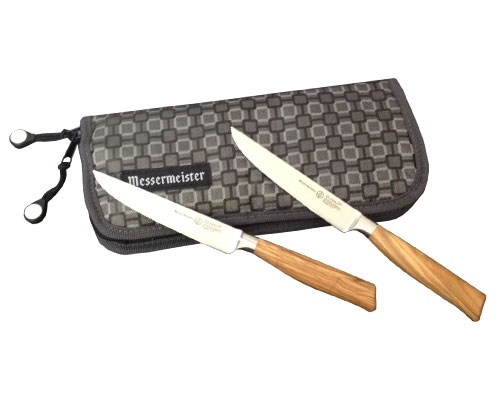 Steak Knife Set comes with a travel bag. 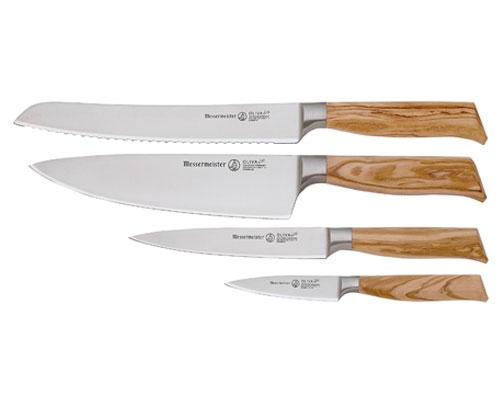 These steak knives have a fine edge, with small serrations near the tip of each knife, that cut steak perfectly.